Interesting list of nominated courses in Golf Digest’s Best New Course in Canada group, which was emailed to me recently. I think it is a great privilege to be on the panel and take it very seriously — I typically see all of the Ontario courses and last year saw three outside the province as well. 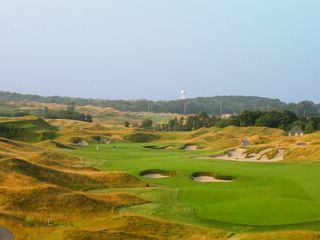 Anyway, there are several top notch courses on the list this year, including Eagles Nest (Doug Carrick’s best work to date), Glencairn (Tom McBroom), Dakota Dunes (Graham Cooke), Georgian Bay Club (Hurdzan) and Heron Landing (Kevin Holmes). I find it hard to imagine that anything will better Eagles Nest (see photo of its 12th hole below), a Doug Carrick golf course created with Cam Tyers (an associate in the office). It is simply the best new course I’ve seen in Canada since Devil’s Paintbrush or the National, and that’s a span covering 30 years. Only Blackhawk, a Rod Whitman course that opened in Edmonton last year is in the same league. McBroom’s Firerock in London is interesting, with cool bunkering, and his work at Glencairn nears his best. Too bad about all the environmental hazards on the back nine that break up the Muirfield theme. There are several other courses on the list this year that I’m not familiar with (Settler’s Ghost, The Links at Piper Glen, Heritage Hills) that I hope to see over the coming months. The end result is that a Golf Digest award for Best New Course is a boon for a club’s marketing. It’ll be interesting to see how this year shapes up, especially after the big questions about last year’s winner, The Rock. see, you’re taste and mine are definitely the same…(great minds think alike…) Devils PB is gorgeous and full of options…the course you picture looks unbelieveable too.